Dockplates are designed to bridge the gap between truck trailers and docks where non-powered equipment such as pallet jacks and hand trucks are used. They are made from aluminum with diamond tread and do not possess curbs. Hand holes are found on each side to make moving by hand easy. Two steel legs are bolted underneath the unit to secure it in place. The standard lip is 11” and the standard bend is 11 degrees. Assortment of sizes is offered to meet various applications and height differences. You may use your freight line as well, just email or call us to place your order. If you order online, please specify your Freight Carrier and account# and we will refund the freight charges. 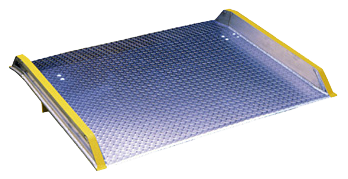 Aluminum dockboards are designed to bridge the gap between truck trailers and docks where forklifts and non-powered equipment such as pallet jacks and hand trucks are used. The capacities range from 10,000lbs to 15,000lbs. They are made from aluminum diamond tread plate with steel sidecurbs. The curbs are used by hand to move the unit around while an optional lifting chain can added for forklift handling. Two steel legs are bolted underneath the unit to secure it in place. The standard lip is 11” and the standard bend is 11 degrees. Assortment of sizes is offered to meet various applications and height differences. © Copyright 1999-2017 packagingconnection.com and Express Worldwide, Inc., all rights reserved. The packagingconnection.com logo and name are trademarks of Express Worldwide, Inc.